Mike Daniels is living proof that nice guys don’t finish last. He’s probably best known in tech/investor circles for his sale of Network Solutions, a small company in Tysons Corner, VA, for $19.2 billion in 2000. You might think of it as a harmonic convergence of an appreciation of the emerging Internet and the tech bubble. But there’s more to a successful 40-year career than a one-shot wonder. Mike’s recent fireside chat at Big Idea CONNECTpreneur’s Winter Forum addressed some factors that have enabled him to continue making the right choices. Monumental financial gain might signal the end of a brief but wildly successful career, but for Mike it just meant it was time to find another challenge and opportunity to support American innovators and citizens. He is moved when he recalls the letters he received from Network Solutions stockholders — many of them “retirees and grandmothers” who thanked him for doubling their retirement funds because they had bought stock in the company he steered. Mike grew up learning the value of hard work and perseverance. The son of a small business owner, he grew up in Cape Girardeau, Missouri, southwest of St. Louis and north of Memphis. He grew up helping out as a janitor, truck driver, and salesman and in summers during college worked at McDonald’s. He learned the value of work, perseverance, and respect for those who do it at any level. He attended the same high school as Rush Limbaugh, with whom he was paired as co-disc jockey on KGMO radio. His lifelong interest in technology began when he attended Northwestern University on a debate scholarship and took a lot of courses at the tech institute. He recalls: “Those were the days we sat in a small data center with punch cards up until midnight to figure out how you programmed everything.” He stayed at Northwestern for graduate school as a Navy Reservist during the Vietnam war, was sent to Washington, DC, to the office of Naval Research, the advanced science and technology part of the U.S. Navy. It was 1969, and Mike happened to be in the first user’s group of the ARPAnet, which is the internet, when they threw the operational switch about two months before. He and his colleagues sat at dumb terminals sending the first emails to communicate with government contractors in places like MIT, Caltech, Northwestern, and Michigan. After the military, he returned to Missouri to add law school to his credentials, but continued watching technology evolve. Mike lived the first half of his 40 years in business in government contracting in Washington, DC, where he moved with his family after law school. “I built major government contractors, kept them, took them public, sold them,” he says. Mike knew he wanted to be in the tech industry, but attended law school in Missouri for some additional background. Nine months before graduation, Mike got a call with a job offer from a guy he’d met while at DARPA, named Jack London. Jack had become the CEO of CACI, a government contractor in Arlington, VA, which was providing information solutions and services to support national security missions and serving Intelligence, Defense, and Federal Civilian customers. He moved back to the Washington, DC area to take the job and learned the business by watching his first mentor. Because he’s an entrepreneur, in 1979 he packed up his wife and kids in the car and moved to Rosslyn, VA to start his own business, Computer Systems Management, with a partner. It grew to a business of about 200 people who worked for Defense, Intelligence, and DARPA. By 1986 he knew it was time to move on. That train was SAIC, which became the largest privately held employee-owned science technology company in the history of the U.S. He uncovered the opportunity by talking to other CEOs in town. One told him to go to La Jolla, CA, to speak with Bob Beyser, the founder of SAIC. In 1987, Mike ran all the networking at SAIC. John Woods, the Patton Boggs lawyer who helped him sell his company asked him to speak with a small company five blocks from the SAIC office in Tysons Corner, VA, called Network Solutions. The company was thinking about making an acquisition and his lawyer thought it would be helpful to speak with someone who had just been through the process. In 1992, Networks Solutions outbid three other companies for the “exclusive cooperative agreement” from the National Science Foundation to sell .com, .org, .net, .edu to everyone on earth and also handle .gov, .mil and every country code for every nation. Nobody much cared about the Internet in 1992, and the small company won a fixed price contract. Mike followed the deal with interest. It dawned on him that the Internet could be huge the year before when a corporate transaction lawyer he’d found in Silicon Valley, Jorge Del Cavo, told him about the venture capital community in Silicon Valley’s interest in the Internet. Over the next year and a half, Mike made Network Solutions five offers to buy the company. They turned him down every time. In 2000, after raising $779 million in the public markets the previous year, Network Solutions raised $2.3 billion, the largest internet public offering of all time. It still holds a Wall Street record as one of the greatest returns on any investment in a 5 year period from purchase to sale. Everyone made a lot of money on that deal, including the individuals who purchased the stock. Mike and Bob Beyster co-authored a book about their experiences: Names, Numbers and Network Solutions: The Monetization of the Internet. Mike credits mentors, friends, and associates that remain part of his loyal circle for their role in his journey. He kept in touch with the best and brightest he could find involved with the developing tech industry. Over the years Mike has served on 22 boards of directors. In the mid-2000s Silicon Valley investors bet on a company in Chantilly, VA, called Mobile365, which brought SMS and MMS messaging technology to the United States. In 2006, Mobile365, a mobile messaging and content delivery service provider, was sold to Sybase in Silicon Valley, the #4 database management company, in an all cash transaction worth $425 million. Today, he serves on the board of directors of Blackberry, CACI International, Mercury Systems, Invincea (Chairman), and the nonprofit Logistics Management Institute (Chairman), which has served as defense logistics experts for the Department of Defense since the start of the Vietnam war and during his tenure grown from $80-90 million to $250 million. Turn off your devices and get out of this from time to time because we are so inundated with junk in the modern world that you need to get away from this stuff. It’s hard to make long-term decisions when you’re being pounded seven days a week, 24 hours a day by Facebook, the news media, and all this junk that surrounds us. Tom Gardner (L), CEO and Co-Chairman, The Motley Fool Company and Tien Wong (R), CONNECTpreneur founder have some fun Fooling around after a seriously informative chat. Georgetown natives, Tom Gardner and his older brother, David, co-founded The Motley Fool company in Alexandria, VA, in 1993 at ages 25 and 27. David had gotten the idea to create a newsletter to educate and enrich investors on long-term investing while he was writing for a newsletter called Wall Street, founded by journalist and economics commentator, Louis Rukeyser. At a recent fireside chat at Big Idea Connectpreneur, Tom, now age 49, explained how David’s frustration with Wall Street’s lack of advocacy led the brothers to found a newsletter that has expanded, contracted, and evolved into a multimedia financial-services company with 300 employees and half a million subscribers. David and Tom’s fondness for exploring what businesses would be fun to invest in started way before 1993. At age 7, 8, or 9 at least one day of every spring vacation would include a visit with a CEO or CFO at a company in which their father, Paul, an international banking attorney, had invested. Their maternal grandfather, H. Gabriel Murphy, showed them that business can literally be a game. He was the largest minority owner of the Washington Senators/Minnesota Twins franchise of the American League. So, when David asked Tom to co-found an investment newsletter with him, Tom agreed to leave his linguistics studies at the University of Montana and his put his BA from Brown to work championing shareholder values, advocate for the individual investor, and call out the industry’s lack of transparency and corruption. Why they call themselves Foolish in a serious industry? One way to differentiate a brand is to acknowledge people’s complaints about the industry and show them you’re different. David was looking in a Bartlett’s Quotation book and saw a quote about the Motley Fool from Shakespeare’s “As You Like It.” He and Tom liked the idea of being like the wise fools that could speak the truth to the king without getting their heads chopped off because they were amusing. Being contrarians helped them differentiate their brand from the larger financial advisory businesses in the U.S. “These advisers have not been serving others as well as they have been serving themselves over the past many decades with their fee structures and conflicts of interest,” he says. The brothers started offering subscriptions to a print newsletter in 1993. They sent out a mailing to about 1200 friends and family. They thought they’d get 600 subscribers at $48/year, but they got only 8. Tom says they realized they didn’t have a business, but lucked upon an April Fool’s joke that spiraled out of control and the Wall Street Journal wrote about it. They had decided to use humor to call out the unethical, and probably illegal, penny stock promotion they were seeing in financial chat rooms. “People were taking an 8 cent stock, telling an incredible story about it, it would jump to 38 cents, they would sell them and it would fall back down to 8 cents or lower.” On April Fool’s Day, after consulting their lawyers, they hyped a fictitious penny stock on an exchange that didn’t exist, the Halifax Canadian stock exchange. Over the weekend, they watched others in the online community start playing along. Some financial advisers were taken in by their April Fool’s prank; others were furious. The Wall Street Journal published a piece about their April Fool’s joke. This prompted a call from AOL, which had just gone public. Ted Leonsis, whose marketing communications company, Redgate Communications Corporation had been acquired by AOL that year wanted to break through with new content. He invited Tom and David into AOL’s offices to speak with eight executives about starting an online business. People following local investors knew about Leonsis, an entrepreneurial Georgetown University alum. Before selling Redgate to AOL, Leonsis had net $20 million when he sold his previous venture, a technology magazine focused on the personal computing industry, to Thomson Reuters for $40 million. Ted slid a piece of paper across the table to Tom and David. They thanked him for the incredibly generous offer but stuck to their father’s pre-meeting advice and told him they didn’t want to sell any equity. They were looking to sign a partnership deal. “That enraged Ted,” Tom recalls. “He was so mad.” This was before everyone had mobile phones. It took the brothers a half hour to drive back to their Alexandria offices before they could call their father and tell him what they’d done. “What was the offer?” their father asked. So they did. That was their first investment and they raised about $55 million before the great recession of 2001. Being on AOL’s platform while it was growing rapidly helped The Motley Fool company grow. They earned about 40 cents for every $4 AOL earned. They loved the organization. But when the great recession hit in 2001, AOL could not sustain them. They realized, too late, they needed to grow their business beyond AOL. Unfortunately, 8 or 9 of those advertisers were discount brokers. When 2001 happened, one after the other informed them they were cutting spending either 80, 90, or 100 percent. By that time, funding was scarce and temporarily out of reach for their company. The Motley Fool had been careful with its money. Up until 2001, it had raised $55 million and grown to 80 employees. At some point that year, the company had $1 million in cash and $5 million in debt with a 20% interest rate. After one year of interest, they needed to have a few rounds of layoffs. To its credit, the organization prided itself on being transparent and posting its numbers internally. The layoffs didn’t come as a shock. By 2007, The Motley Fool company began the highly unusual process of buying back all of their venture investors and choosing to remain private. One investor sued them to try to force them to go public.It was resolved. The net result, now we’re on the other side of it and age 49, 24 years into the Motley Fool, I’m more excited than I ever have been because we have the resources, the ideas, and the network to deliver much bigger changes in the world of finance than we have. Though both Gardner brothers have ideas for keeping their business relevant, they see them through the lens of different, complementary personalities. Tom’s the self-described people person who practices his listening skills while he’s talking. David’s the systems thinker, who in middle school at the exclusive St. Albans prep school in Washington, DC, organized an underground, 24-team strat-o-matic baseball league. He kept track of statistics, compiled standings, and organized the league’s complicated schedule. Tom and David still co-lead The Motley Fool Stock Advisor, the company’s flagship subscription offering and David is the lead advisor on The Motley Fool Rule Breakers advisory service. David invented the Motley Fool CAPS site, which features community intelligence of 75,000+ ranked stock picks drawn mainly from the Motley Fool Community. Their company reaches millions of people each month through its website, books, newspaper column, television appearances, and subscription newsletter services. The Motley Fool company is organizing its intellectual property more efficiently so members can view the data from different investing styles to see which is right for them. At the moment they’re also creating subsidiaries and taking outside investment in those from investors with a super long-term perspective. They’ve made available the FoolWorks tool at the core of developing a motivated, committed corporate culture. The brothers have learned to work through conflicts, rather than avoid them. The single idea The Motley Fool stands for most is a long-term holding approach to building a personal investment portfolio. The team brings a qualitative view to investing. They favor founder-run businesses, which tend to beat the market by 2%. There are about 550 of them in the U.S. They contact all the CEOs and get to know the founders and teams. Their network is key. There’s someone on their team whose full-time job it is to point to interesting people to get to know. Tom says he is wrong 40% of the time and about 10-12% of his investments drive 85% of his returns. Other investors at the company are right 80% of the time and their aggregate returns are lower but their portfolios are less volatile. David approaches the market as a venture capitalist would. He seeks out the highest-growing emerging businesses that have founders actively involved with the business and are truly innovative and disruptive. He’s always looking out of the next Amazon, Priceline or Facebook. Investing in search of the next great growth company means being right less frequently, e.g., a few companies drive 90% of your portfolio’s returns, and you’ll best the market in an open market like the U.S. The wise Fool distinguishes actions depending on the stage an investor is in. As U.S. investors focused on technology companies in 1998, Seth Goldman and Barry Nalebuff, his former professor at Yale School of Management, took a different route. They co-founded Honest Tea, an organic, lightly sweetened bottled tea. The co-founders were on a mission to make healthful consumer beverages mainstream. Goldman liked marketing a good product, but says he also had “become awakened to the idea that a business could be a driver of social change,” while at Yale School of Management. The broader mission of Honest Tea, and Goldman’s latest venture, Beyond Meat, for which he serves as Executive Chairman of the Board, is to improve people’s health, have a positive impact on the environment through the food system, agriculture; create fair trade labor standards and support community wealth. Goldman was prompted to pursue the idea for a healthier beverage after he’d taken a run in Central Park to decompress after a presentation at a New York City institutional investment conference. He was thirsty, walked into a market, and realized there was nothing there he wanted to drink. It reminded him of the market opportunity he had Nalebuff had discussed in class three years earlier. Honest Tea did not market through television commercials. Instead, the bootstrapped business held in-store tastings at Whole Foods (formerly Fresh Fields) at 17 upscale locations where it launched. Fundraising was tough for the consumer beverage product. They launched in the kitchen of Goldman’s Bethesda home. The co-founders raised $10 million over ten years. Early on, they raised money from friends and family. By 1999-2000 they raised $1 million most of it from individuals who liked their product. Their average investment check (from an individual) at that time was for $25,000. Later, bigger investments rolled in from specialty food businesses whose CEOs brought industry experience to Honest Tea’s board. They made mistakes, too. Early on, they lost $1 million trying to own and manage a bottling factory outside Pittsburgh because they mistakenly thought they needed to own their production. For six years he commuted every few weeks from Bethesda at 3:00 am and returned home to his growing family by 8:00 pm. Goldman calls this time “the darkest years of my life.” What kept him going was the idea of Honest Tea becoming a national brand. Goldman and Nalebuff recently created an illustrated book about their experience called: Mission in a Bottle, which Goldman discussed at a recent fireside chat with Connectpreneur’s founder and DC Metro area tech entrepreneur, Tien Wong. The co-founders launched Honest Tea with health conscious consumers and developed the brand before seeking corporate investment to expand. Things started taking off in 2006 and by 2008, Honest Tea had become the best-selling, organic bottled tea at Whole Foods in 15,000 locations nationwide. That wasn’t where they wanted to stop. The mission was to take healthful, organic beverages mainstream. That meant going national, while preserving their core values. Before selling to Coca-Cola, the co-founders took a 40% investment from the corporation’s new “Venturing and Emerging Brands” program, with an option to buy in three years.The co-founders used the time to continue growing its line and made sure the brand was not only certified organic; it was certified Fair Trade so it would give back to communities and support acceptable working conditions. By putting in place certifications from reputable organizations, nobody could cheapen their brand. Honest Tea’s board had first-hand experience to help..”We had people who knew the industry, who knew branding, and natural foods,” says Goldman, including the CEO Stonyfield farm, the head of Timberland Footwear Co., and the head of Saratoga Beverage group, an independent Pepsi Bottler. The Honest Tea team worked hard to increase shareholder value. Its founding investors received a healthy 26 X return. Today, Honest Tea is a national brand with over 125,000 accounts. Goldman looks to the future, and is now helping to build Beyond Meat, a privately held California-based company that has recently closed a $30 million financing to commercialize the first plant-based protein food with the taste, chew, and sensory satisfaction of animal meat. It took research from about 14 PhDs to get to the commercialization stage. It’s a big idea. Meat is the world’s biggest food category, $200 billion in the United States alone. And it’s got global potential as a sustainable source of protein for countries whose water and land do not support a meat industry. That’s probably what attracted Bill Gates as an investor. So what is the takeaway for entrepreneurs looking to build their own vision? The journey begins with a product mission. For Goldman, it was serving up a healthy life and lifestyle. An essential part of this mission is to protect the environment and enrich communities. Please visit this story on Startup Grind Medium, scroll to the bottom, and hit the heart to recommend it or leave a kind word to let the editors know you appreciate it. Thanks! Tracxs CEO, Rick Rudman (L) tells Tien Wong at Connectpreneur about life as Chairman and CEO for automated marketing software company, Vocus, in a $1/2 billion cash transaction. When you read about people launching tech careers in the mid-1980s, it’s easy to chalk up their success to serendipity. Rick Rudman was lucky to be in tech at the moment in history when the PR industry needed to be automated. However, nothing else about his remarkable journey was a given. Determined to fulfill his commitment and follow his instincts, Rudman took night classes as he completed his four-year tour. Along the way he was promoted to Sergeant. He took 51 credit hours in his last year at Maryland and graduated with a degree in accounting. He is proud to have graduated within months of his high school classmates. It was the mid-1980’s, the internet was starting to come alive. After Rudman graduated he got an accounting job at a private company, started teaching himself how to program computers at night, and switched to the data processing department. By 1997, the software business had about $2 million in revenue from its government relations software and a buyer had come along offering to buy the business for $6 million in cash. The co-founders didn’t know why their prospective buyers pulled out. However, they did know that the investors were planning to put their government software together with a PR software company. Despite their profound disappointment, this detail did not escape their attention. “When the deal fell through, my co-founder and I looked at each other and said ‘PR software sounds like a good idea.’ And, we went off and wrote PR software, which basically became the flagship product for Vocus for the next 15 years. That’s what took us from a couple of million in revenue to almost $200 million. The PR industry required automation as it expanded from distributing press releases to newspapers to become direct to consumers and online search. A $30,000 loan from the co-founder’s father enabled the team to found Vocus and build software for the PR industry and sell it to very large enterprises and midsize agencies. The company was profitable in year one and reinvested in growth. They learned to partner with organizations such as Associated Press (AP), which in 2007 began allowing Vocus users to distribute press releases within the AP network. They accelerated their growth by acquiring businesses in the space, such as PR Web. At some point, they ended up acquiring the company with which their would-be investors had planned to pair them. Vocus grew by about 38% each year. As Vocus grew, Rudman’s co-founder indicated the need for more funding with a quote from the classic movie, Jaws: “We’re going to need a bigger boat.” Though still expanding, the company was on the verge of not making payroll for 52 employees. The co-founders cut their team to 40 and figured out they had to make $300,000 a month or Vocus would be out of business. By the end of the year, Vocus was making $400,000 a month. The co-founders had passed on the first funding offer from Edison Ventures because they felt the valuation wasn’t high enough. Six months later, in a rare move, the venture capital firm returned. They opened up a $2 million A round. When Vocus went public in the beginning of 2006, it still had $5 million of the $13 million left in the bank. “It was a different era,” says Rudman. The company continued to grow by about 38% a year for 15 years. When the economy crashed in 2009, for the first time its annual growth shrank to just 5%. “That was a tough year,” says Rudman. “We spent the next two or three years just trying to grow back to a high-growth model.” High-growth software models get higher valuations. By 2010, the company was able to accelerate its growth by acquiring similar public relations software companies, such as Datapresse, BDL Media, and Help a Reporter Out. Whenever you have over 2 billion people that are active on some type of network, forum, physical location — anywhere — marketers will go there. You have access to 2 billion people. What I love about this space is it’s fundamentally changing the way companies are doing business. Social’s not a fad or even a channel. It’s how companies are engaging with customer/prospects and doing research…I think you can build a lot of value. The space is enormous, it’s still developing, and it’s going to change over the next 2-3 years. Tracx, created in Israel, will maintain a small New York City office but open its main space this August on Woodmont Avenue in Bethesda, MD. Read Rudman’s personal account of life after his big company exit and why he jumped back into the CEO role with Tracx here. 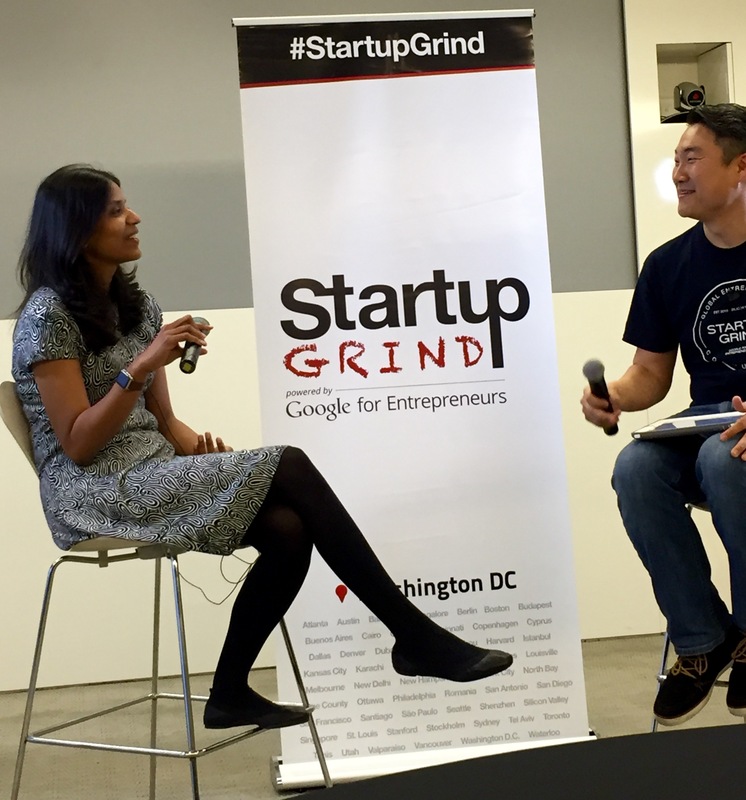 Archana Vemulapalli (left) the Chief Technology Officer for the District of Columbia tells Startup Grind DC’s Brian Park (Right) she’s recruiting technology the city needs to keep moving on projects. Six months (now 11) into her tenure as the Chief Technology Officer (CTO) for the Mayor’s Office of the District of Columbia, Archana Vemulapalli is on a roll. The 36-year-old engineer manages more than 33,000 employees, oversees 21 departments, 33 independent agencies, roughly 69 legislatively mandated offices, and five regional bodies. Aptitude made it possible for her to begin her journey, but attitude has been critical to her success. Vemulapalli says growing up in a home without gender role stereotypes gave her the confidence that she could pursue anything she wanted. Her father is a doctor. He made it clear that her stay-at-home mother, an economist, was the head of the household. When her mother mentioned learning to cook, it was in the context of something that is nice to know how to do to survive on your own. She thinks schools also need to get more creative about their approach to engaging girls in technology. Vemulapalli came to the U.S. from India in 2000. She was 20, had a B.E., Electronics & Communications Engineering, from the University of Madras. She came to the University of Pennsylvania for an MSE in Telecommunications & Networking. Then, she moved to Washington, DC, to sharpen her leadership skills at Georgetown University’s McDonough School of Business. She followed her interests to the Women in Technology Foundry Program. By 2015, Vemulapalli was selected to engage in intensive, in-depth discussion of regional issues with senior leaders as part of Leadership Greater Washington’s Signature Program. One day she was surfing the web, found the DC CTO job online, and applied. During the interview process she had conversations about how technology could help DC be better. It never occurred to her to ask how many other job candidates had applied. Part of the CTO’s strategy for moving swiftly on immediate tech needs is to identify how to engage startups instead of building from scratch. Beyond traditional requests for information (RFIs) and requests for proposals (RFPs), the team reaches out for information and promotes DC technology at major tech events. WeDC was a prominent display promoting DC tech companies at SXSW. Coming soon: Watch for DC government hackathons, pitches, and reverse pitches to match up needed and existing technology from local startups. 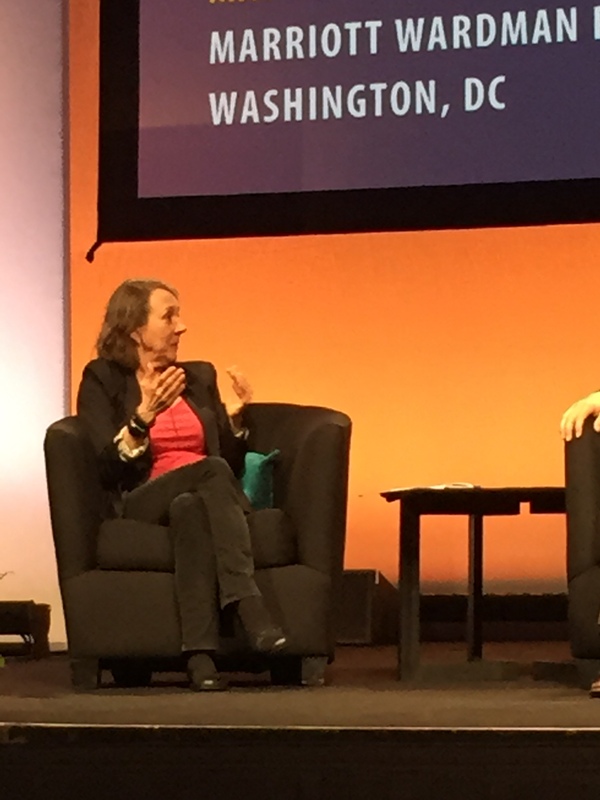 In addition to serving individual agencies, the CTO has begun to use data to run what she calls a Smarter DC. Vemulapalli suggests that instead of pushing to excel and prove beyond reason that they’re great at something to get promoted, women should be direct and ask for the opportunity to show their potential. A version of this story appeared in StartupGrind.com. It’s 7:15 am and Mark Walsh, Associate Administrator, Office of Investment & Innovation for the Small Business Administration takes the photo op anyway. Mark Walsh is the ultimate connector. He’s smart and his can-do confidence, experience and business/political connections and know-how have positioned him to invest billions of taxpayer dollars into a diverse cross-section of American innovators for the U.S. Small Business Administration (SBA). Mark is Associate Administrator of the SBA’s office of Investment and Innovation. He recently told the capacity crowd at a Connectpreneur networking event in Bethesda, Maryland, how his fateful stint as chief executive founder at liberal talk-radio, network Air America Radio, led to his current adventure. It was there that he met Javier Saade who later called him for a recommendation for a job to help the SBA invest billions of tax dollars in a fund of funds (a portfolio of other investment funds) and startups. The SBA Associate Administrator for Investment, Special Advisor for Innovation, at the time Sean Greene, had been a sales executive Mark knew from AOL. Startups = $2.5 billion in cash, not debt, each year and a trip to the front of the line for a license, to thousands of entrepreneurs with technology that is matched against government research needs. Investment examples include iRobot, the Roomba robot vacuum built on technology that remembers surfaces covered when sweeping for landmines in the field; Epibone, which grows human bone; a replacement for Styrofoam packing pellets made of mushroom material; and a utensil that compensates for a shaking hand, a simple idea/company that Google just purchased. Mark spends a lot of time in what he calls “the political zone.” He was the Democratic Party’s first Chief Technical Advisor and Head of Internet operations for the Kerry Presidential Campaign in 2004. Like his colleagues, he will be prepared for the changes a new administration could bring, but assumes that at his level it will have months to prove himself. In an effort to keep his dream job, Mark practices positive, politically correct speech — careful to add phrases like: “I joke because I love…” just in case some innocent humor could be misconstrued. A straight shooter, who has been known to swear for good effect, Mark honed his diplomatic skills over about eight years as the Chairman of the Board of Directors of the Bipartisan Policy Center, a think tank (they fondly called a “do tank”) founded by four former heads of the US Senate: Tom Daschle, George Mitchell, Howard Baker, and Bob Dole. In the Washington, DC, startup trenches, Mark was executive chairman of Homesnap.com, a residential “prosumer”real estate platform/app backed by fellow AOL alum via Revolution Ventures (September 2013 – November 2015) and CEO and co-founder of GeniusRocket (June 2007 – November 2015), crowd-sourced marketing for major brands and global nonprofits. During these years and earlier, beginning in January 2003, as Managing Partner of Ruxton Ventures, LLC, he served on a mixed bag of boards. On the big corporate side, has been a division head and senior executive at technology and content companies, such as GEnie, AOL and HBO. It wasn’t always sunshine and sausage. Mark lived through the March 2000 dot-com bubble collapse as CEO and Chairman of VerticalNet, which he took public on the NASDAQ in 1999. Terrible but instructive times. Esther Dyson, created Way to Wellville to contribute to what’s known about how communities can generate health. On the eastern shores of Lake Michigan, Muskegon, Michigan, has it all: recreation, festivals, a couple of Miss Americas, an Astronaut, actors, musicians, a U.S. ambassador, an NFL quarterback, a wealthy lumber baron, a TV evangelist and others who have achieved in broadcasting, science, technology, literature, and politics. However, the most densely populated city in Michigan (2010 Census, 38,000) has another side, not featured on the local Chamber of Commerce website: Muskegon fell to last in the state for public health. What happened after they hit bottom is when things got interesting. I might never have heard of Muskegon had it not won one of only five slots for a ten-year cultivation program called the Way to Wellville, created by Esther Dyson. Together, the county is pulling together over a ten-year period to improve key health markers so it can figure out how this and other communities can support a healthier population. About 18 years ago, Jeff Fortenbacher, now age 55, CEO, Access Health, returned to a suburb of Muskegon after attending college in Florida and spending time away. He got his masters in psychology, and set up shop not far from his father’s foundry, which manufactures metal castings for many different types of products. Jeff practiced psychology for 10 years, gravitating towards and landing in management/administrative roles, such as his role at his local Health Department. He understands the importance of addressing the psycho-social determinants of illness or health. Muskegon is fertile ground to explore community instances of: alcoholism, depression, homelessness, hopelessness, mental health needs, smoking/tobacco/substance abuse, obesity. It was found to have the highest instance of smoking and obesity in the state. Why so many uninsured — and under-insured — working citizens? These are the mom and pop businesses and local contractors and freelancers who work hard every day but don’t have sufficient health care coverage to protect their savings in the event of a catastrophic event. Our approach was to leverage the person’s access to our healthcare services to say you have to be an active participant in your health care. “We gathered and disseminated data in cooperation with local businesses, the health system, and other community leaders, from religious institutions to local, environmentally conscious groups,” says Jeff. It would help when they donated their staff time to assist with local county contracts. Jeff applied the lessons learned from his home-care company. He thought, in a sense I have a problem because the symptoms are there for a reason, a lot of times those symptoms are there because of behaviors and other things that need to be addressed. Under the Access Health model, each person has an individual health coach whom they meet with twice per year. There’s some preventive care and they meet with an exercise physiologist or a trainer. They set goals. It is better than overcrowding the Emergency Department, today’s correct term for Emergency Room. Maybe they’re hoping people won’t be able to find it? Under the current system, the hospital is still a profit cetner, rewarded a high dollar value for donating community services. A healthy, fun routine for diabetes prevention instead of waiting and having to amputate? Yes, please. He based his practice on asking for referrals of the most difficult patients — the ones always calling their doctors for visits, but were non-compliant. They waste time and money without getting a handle on the factors that have a negative impact on their health. Jeff says: “If someone’s depressed, helpless, hopeless, isolated, all those things going on why are they going to take their medications as prescribed? They aren’t. They aren’t going to go to treatments either. So, I would go in and we work with them on multiple different things, whether it was financial health, social health, or physical health. Jeff’s multidisciplinary approach required that people agree to engage with their health care. Jeff’s strategy, individual tracking software, and coaching team for each individual’s active engagement in healthcare reduced spending an average of $70,000-$80,000 in home care services down in to the $15,000-$20,000 range. They kept track of people by requiring several visits a year and telephone intervention and/or personal counseling visits to discuss recurring symptoms. The idea, was not to note that health markers were deteriorating, but to do something about it with a health coach. Jeff’s engagement/accountability model was a great idea. Less than a great idea was building his entire caseload around cases with the toughest patients, who required hundreds of initial visits to get them on their est chance for a healthier, sustainable path. Treating significant psycho/social issues to address did not improve when the healthcare rules changed. People needed time, often hundreds of visits, to scope out a plan with which an individual could live a happier, healthier life. The data collected could help Muskegon with better community practices and leadership fueled by requiring individuals to participate in and take responsibility for their health. Stay Active Muskegon (SAM), which established the expectations of more movement and how to get its community’s people more active as a way to increase local health. It had not been tied to engaging people in healthy routines and holding them accountable for more movement. Things really started taking off when the local Rotary stepped up healthcare as a priority. The town kicked off the initiative with a series of billboards that put two objects representing health and unhealthy choices per board — a running shoe and a recliner chair; a cigarette upright next to an asparagus stalk. It was part of a campaign that illustrated how small changes add up to a healthy life. Access Health software feeds in data from individual Fitbits and other devices to maintain a patient overview and early warning system. That’s when a coach is alerted to start a discussion with the insured. “Under the current fee-for-service system, people chase CPT Codes, which prescribe every procedure a doctor or hospital performs. The CMS is starting to say, we can’t continue doing this. We need a value-based system. We came up with a software system and a way to assign a health risk score to each individual in our system. As they move to a capitated system, which provides a set amount e.g., $300 per member per month to manage this population, healthcare campaigns need optimization. Preventive care, education, support, and accountability are helping Muskegon make small changes that could add up to a community with a healthy population. Esther Dyson and the Way to Wellville team brought questions to the table to help ensure there was a defined structure around the program — goals, processes, expectations, metrics, and review. It’s a big topic. Over the past year, year and a half, Esther and Welville have helped the 1 in 21 team to clarify its goals and how it hopes to achieve them. “How are we going to keep it focused? What is the existing capacity — such as Access Health, and what specific things will they do? Led by 1 in 21 coordinator, Jamie Helsen, 1 in 21 will be adding some structure to the program, defining specific metrics, and then looking no just at the leadership but also at bringing the community along to support them. To date, because of some of the things they’ve done Muskegon has been designated as a States Innovation Model Community/grantee. Esther herself has been instrumental in saying ‘You guys need to do things to get more focused. You have ideas but not total understanding of what it takes to drive and make the changes.’ She reminds us we are dealing with years and years of embedded behaviors and changing direction of a huge ship of generations of culture. The Wellville Five and the Way to Wellville team will be talking about their progress and learning from their mistakes as well as their successes over the next eight years. By the end, they hope that others will be following their lead in cultivating a healthy population.